The whole team here at CMB was fascinated when we read this story in the Dallas News, and had to share it with out fellow attorneys. Meet Frank Howell, a Dallas County court reporter that is one of the few people who isn’t letting technology dominate his world! For this 79-yearold, pen and paper continues to suit him just fine – as he can actually write faster than you talk! Howell is fluent in shorthand, which he learned in college. He uses this skill to take down verbatim every single word said “on the record” in the courtroom. Getting down every word is a difficult task, even for those who rely on high-tech keyboards to get the job done. Frank is one of only three remaining “pen writers” in Texas who are active and licensed to do the job by hand. In addition to being both a master and fierce protector of this dying trade, Howell is somewhat of a legal legend in Dallas. He’s been working this job for more than half a century, which is longer than many practicing attorneys have even been alive! Howell has witnessed riveting trials and some very significant moments in Dallas County history. 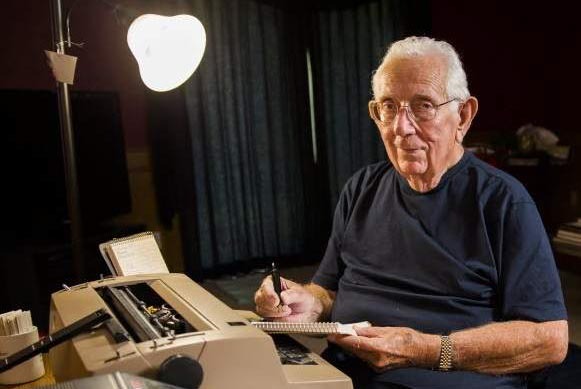 Though Frank is nearly 80, he and his colleagues agree that he’s just as productive as colleagues who use special keyboards that allow them to produce drafts of testimony in real time. These days, Howell is working part-time at the criminal courthouse, upholding his long-time reputation as a straight-shooter whose court records and interactions with others are equally as frank as they are funny! Frank has no interest in retiring and remains committed to keep doing things the old-fashioned way. Unless they take away his pen and paper!